In the extreme east end of the municipality of Beijing is the Pinggu District. 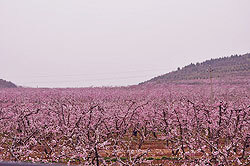 Mountains frame three fourths of its borders, and Pinggu’s soils are fertile and its air is brisk—ideal for peach and persimmon planting, which Pinggu prides itself on. Pinggu is one of the last Beijing districts not linked to the modern world via an expressway. But plans for this are already in the works.